According to a new report North America Infrared Imaging Market, published by KBV research, the North America Infrared Imaging Market Size would witness market growth of 5.8% CAGR during the forecast period (2017-2023). The Long-Wave Infrared market holds the largest market share in North America Infrared Imaging Market by Wavelength in 2016 and would continue to be a dominant market till 2023. The Shortwave Infrared market is expected to witness a CAGR of 7% during (2017-2023). Additionally, The Near Infrared market is expected to witness a CAGR of 7.4% during (2017-2023). The US market holds the largest market share in North America Security & Surveillance Infrared Imaging Market by Country in 2016 and would continue to be a dominant market till 2023; growing at a CAGR of 4.3 % during the forecast period. The Canada market is expected to witness a CAGR of 8.8% during (2017-2023) in North America Monitoring & Inspection Infrared Imaging Market. Additionally, The Mexico market is expected to witness a CAGR of 8.4% during (2017-2023) in North America Detection Infrared Imaging Market. The UnCooled Infrared Imaging market holds the largest market share in Mexico Infrared Imaging Market by Technology in 2016 and would continue to be a dominant market till 2023; growing at a CAGR of 6.4 % during the forecast period. The Cooled Infrared Imaging market would garner market size of $139.9 million by 2023. The market research report has exhaustive quantitative insights providing a clear picture of the market potential in various segments across the countries in the region. 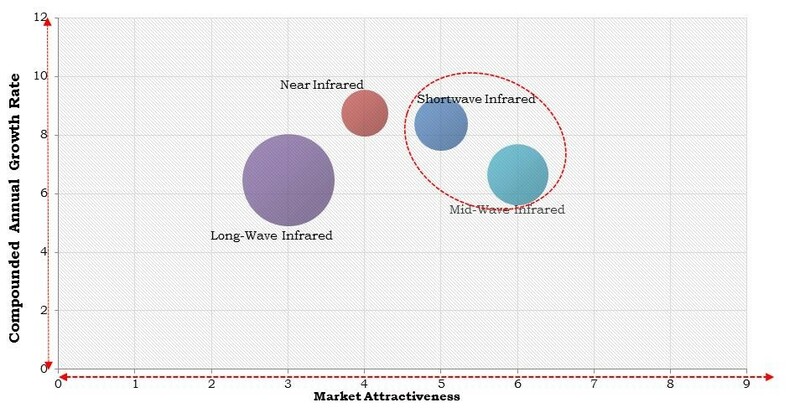 The key impacting factors of the North America Infrared Imaging Market have been discussed in the report with the competition analysis and elaborated company profiles of Flir Systems, Inc., Fortive (Fluke Corporation), Sensors Unlimited, Leonardo DRS, Axis Communications AB, Xenics, Opgal Optronic Industries Ltd., New Imaging Technologies, Allied Vision Technologies GmbH, and Sofradir.